Harrison Gardens at 255-271 South Harrison St. in East Orange — Courtesy: The Kislak Co Inc.
A private investor has paid nearly $13 million to acquire two multifamily properties in East Orange, including an 88-unit brick building and a 44-unit garden complex. The larger of the two, Harrison Gardens, is a midrise building located at 255-271 South Harrison St., according to The Kislak Co. Inc. 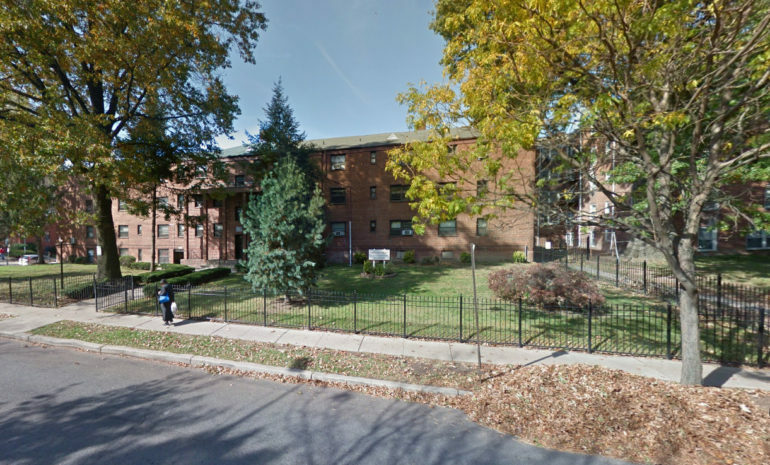 The second property is Elm Gardens, a 44-unit complex at 296-310 South Harrison St.
Kislak Senior Vice President Joni Sweetwood represented both parties in the $12.75 million deal. Kislak said Harrison Gardens, which includes 27 one-bedroom and 61 two-bedroom apartments, has undergone extensive upgrades in the last 10 years. The improvements include the replacement of roofs, boilers, the hot water heater, expansion tanks and fire alarm system, along with the installation of a surveillance system. The two-story Elm Gardens complex consists of all one-bedrooms and have undergone similar upgrades, Kislak said. For both properties, the firm touted the proximity to NJ Transit’s Brick Church train station. “The properties also have value-add potential given their location and the purchaser intends to upgrade the properties to the luxury standards of the area,” Sweetwood said.